Is This The World's Only Pagani Zonda Kit Car? For sale right now in a suburb of Ontario is this, possibly the only Pagani Zonda kit car in the world. $5,000. Some assembly required. According to the seller in Woodbridge, ON, this is the "only one out there!" 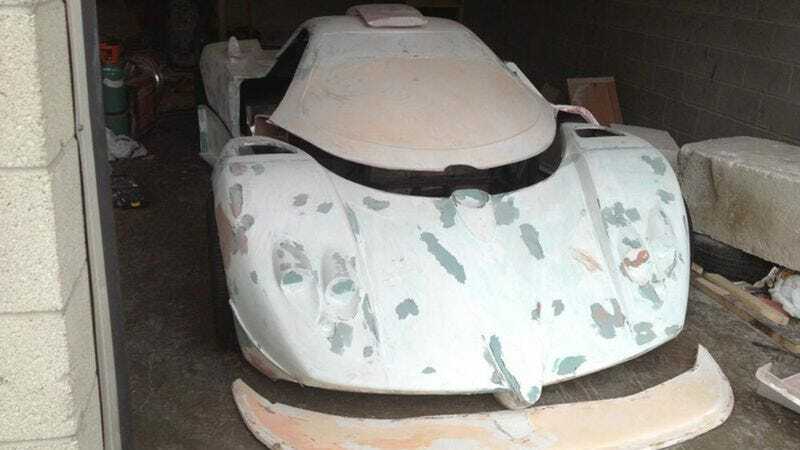 Given that Pagani makes all of its components in-house, we have no clue how this Canadian managed to get his hands on parts or a full body mold. We normally come down against kit cars, but taking it upon yourself to make a unique kit of such a badass car is good in our book. Here is the full text of the listing (go here when it disappears). I am selling a pagani zonda kit car. it has full fiberglass body and interior parts. Comes with Frame. I will also include carbon fiber rolls that i purchased and pagani zonda seat covers. We can't help but be reminded of the lone man building a Bentley Speed 8 replica, which is still very much under construction after five years. Still, we hope this thing gets finished, and we hope it ends up with something other than a ubiquitous Chevy V8. How much is a wrecked SL73 engine anyway?